Need some quick children's ministry lessons? KidMin Quick Picks are the perfect solution! These easy-to-use, downloadable lessons are packed with interactive learning experiences, fun activities, media, and thought-provoking discussion questions that'll deepen kids' faith. Perfect for mixed-age classes of elementary kids. Lessons are flexible and can be adapted to a variety of classroom formats. New lesson packs available each month so come on back often! Key Scriptures — Teach kids specific verses from God’s Word that reinforce the lesson. Bible Basis for Teachers — Help teachers get a quick grasp of the Scriptures in the lesson. The Lesson at a Glance — Give teachers an overview of the lesson. 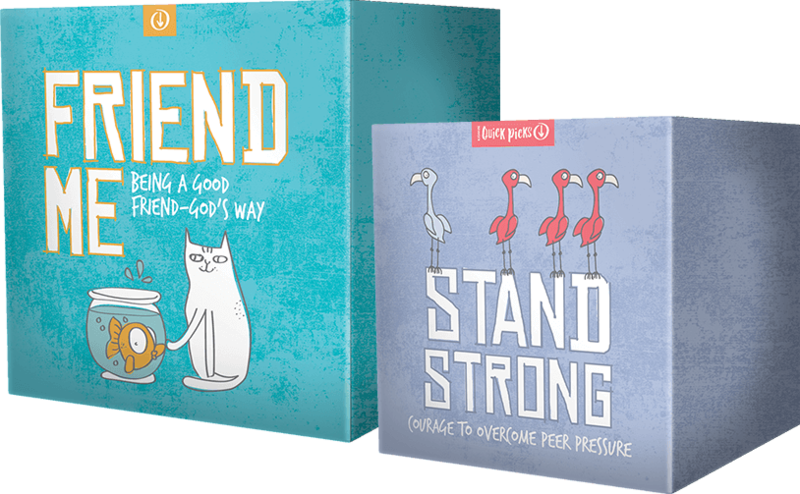 Opening Activity — Help kids relate, have fun, and get ready to dive deeper into their faith. Bible Study — Open deeper discussion on the Scriptures as kids learn what it means to them personally through engaging and thought-provoking experiences. Small-Group Bible Study — Kids work closely with their peers in a small group as they explore the Scriptures. Provide parents with insights about what their kids learned — and help them continue the discussion at home. All KidMin Quick Picks only $29.99 each!